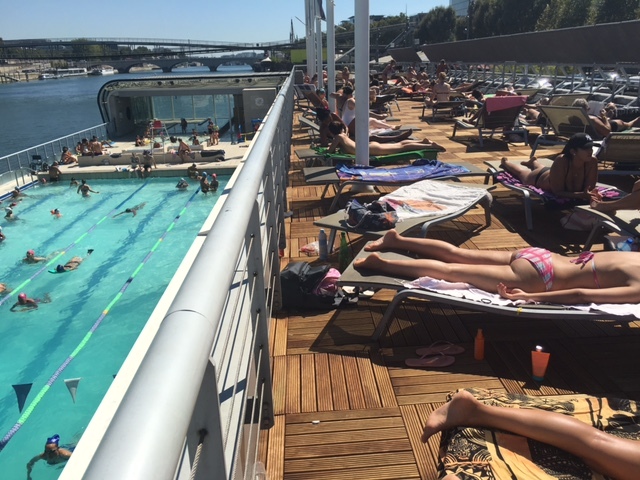 Paris Weekender - Outdoor Pool Time! Earlier this year, I wrote about the Joséphine Baker pool in Paris’s 13th arrondissement. Thursday, at the height of the canicule (heat wave), I thought it was a good time to visit the pool again! There was a bit of a line when I arrived at noon, but it moved quickly. 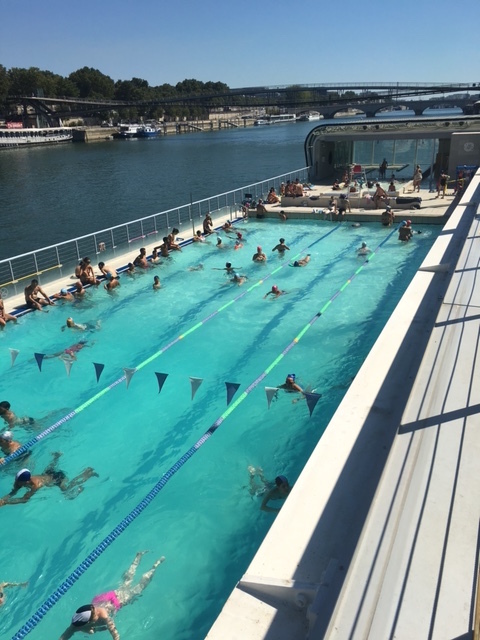 It’s 6 EUR to get in, even (in July & August) if you already have a Paris pool pass. That entitles you to two hours. It’s 6 EUR for each additional 2-hour stay as well. For 3 EUR, you can buy a swim cap (required if you don’t have your own and want to go in the pool). It’s 1 EUR to rent a locker. The changing/locker room was a bit of a turn off. Not a good place for germaphobes. But you have to wade through water (and you are supposed to shower as well) to get out of the locker room. Once you’re on the other side, things are looking a lot brighter. The pool was crowded but the water was so nice that I didn’t care. There are two lanes dedicated to lap swimmers and a double lane for people just taking a dip. There’s also a separate kiddie pool. There may be nicer (indoor) pools in Paris, but what’s great about the Joséphine Baker pool is the sun deck upstairs. There are probably a hundred chaises longues, all with (for better or worse) relatively unobstructed sun. There are no umbrellas! I did have to wait a few minutes to get a chair. And of course, being Paris, there’s no orderly line–you have to fight for the free ones. But once you’ve found one, you can leave your towel and bag to claim it, even when you go down for a dip in the pool. For 9 EUR in total, not a bad way to spend lunch hour during the canicule. A word of warning–you cannot buy water once you enter the lock rooms, so be sure to bring water and any snacks with you!